Found this one this past weekend at a yard sale and almost didn't even pick it up since this sequel is so common. Promotional rental screeners are like the red-headed stepchildren of VHS collecting. Some ascribed rather crazy value to them, but collectors know most are usually just poor quality versions of a final product. This one's not too special and it doesn't help that Freddy's Dead is mostly awful. The last sliver of demented relish in killing from Freddy in The Dream Child totally gives way to a kid tested, mother approved cereal box version of the slasher icon. Played for laughs with the worst "cold lasagna mask" Krueger make-up of the series. The best thing about Freddy's Dead is its truly excellent trailer. There's a rental marketing segment in front of the film running down the quotes and cast description on the back cover. A buy six, get the seventh free deal is detailed for video stores. Each copy cost a whopping $90, makes you wonder just how many rentals that would take just to break even if buying seven at nearly $550. There's also a trailer for the 1988 Pet Shop Boys musical It Couldn't Happen Here included for some reason. 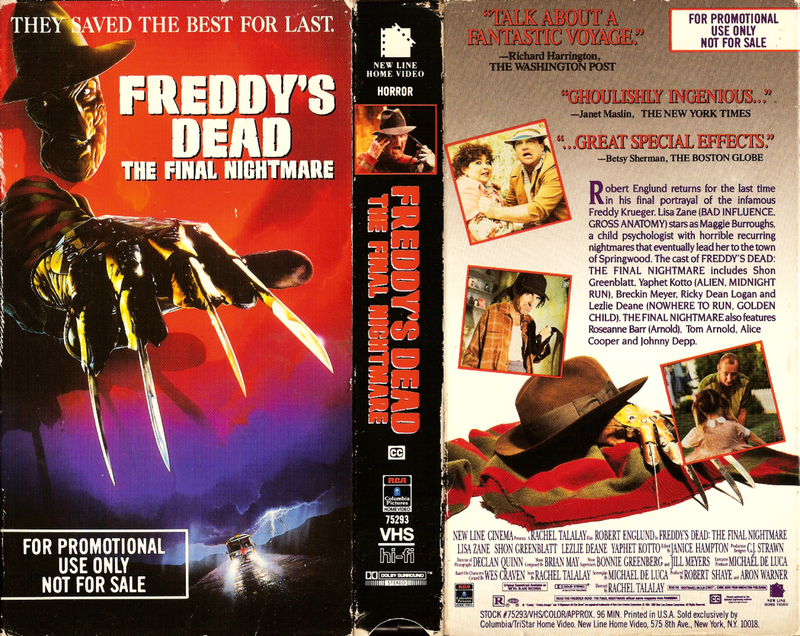 The version of Freddy's Dead here is identical to the regular theatrical cut with none of the TV scenes or 3D conclusion. Unlike many screeners, the tape is in SP and New Line's "Not For Rent or Resale" screen tag only briefly appears every twenty minutes or so. 1. The bit in the van where the one guy goes "The map says we're fucked! ", as "You're fucked!" is literally scrawled on it in blood. Ha. 2. Johnny Depp's good-natured re-appearance in the series for the goofy "brain on drugs" bit when Spencer gets offed. Wow, you actually pass on buying tapes?! Thought you had vhs OCD.